The north shore of Lake Ontario has seen a strong salmon run this fall and it’s not over yet. Considering rivers have little water the fishing has been stellar in Southwestern Ontario. Low water levels forced schools of salmon into long and deep stretches, which is where they are now. These fish tend to be in the low 20-pound range, but we’ve seen them up to 35 pounds. High concentrations of salmon have been patiently waiting for rain and increased river flows so that they can continue their migration upriver and spawn. Low water years aren’t the greatest for the fish themselves, but it stretches out the season and still provides action throughout the lower stretches of our rivers. 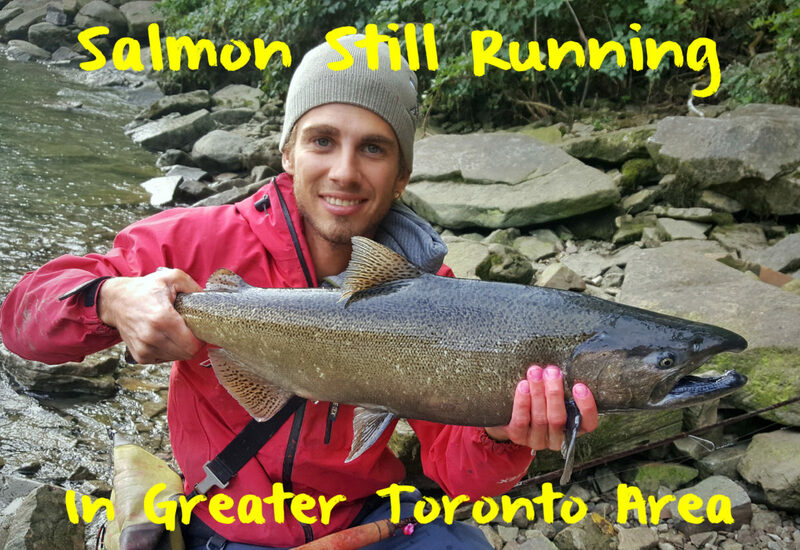 As I mentioned in my last blog there are salmon all over the GTA. Closest to Toronto the Humber River, Credit River and Bronte Creek has fish as do all of the tributaries east of the city such as the Ganaraska River, Wilmot Creek and Oshawa Creek. The Niagara River and Port Dalhousie are beginning to see more and more fish as the temperatures drop and rains draw more salmon in. These systems have peaked but plenty of salmon remain. North of us they are seeing the same thing; Georgian Bay, the Beaver, Bighead and Nottawasaga River have fish. Skein fishing chunks of eggs cured with Red Fire Cure mixed with Pink BorX O Fire has been the ticket for me. Fished suspended under a float in slow and deep water, skein fishing is definitely the most fun way to catch salmon besides catching them by trolling or casting hardware. One thing to keep in mind when float fishing with skein is that the bite is better throughout the middle of the day, compared to the traditional first light and last light bite. I have noticed that salmon prefer sunny days over low light days when it comes to skein fishing. 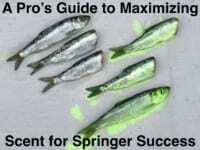 To have good success when skein fishing you don’t need fancy equipment. A simple float and hook presentation works wonders, even if it’s a red and white bobber. Depending on the size of the chunk you use, any float over the 6-gram range will work unless you are running fairly big chunks of skein. If you are casting far and fishing deep water I’d recommend a slip float at least 11 grams or heavier. If the fish aren’t biting at a certain depth adjust your rig to bring your bait closer to the bottom or in some cases suspended way off the bottom. 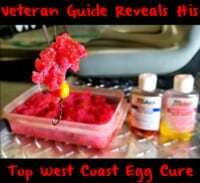 Orange, natural, pink, and red cure eggs are all fish-catching colors, however I prefer using the blend of pink and red almost all the time just because I find that the brighter colors will trigger the most aggressive fish to come at the skein chunk first. Judging the forecast for the next few weeks and the amount of water that is in the rivers now, the salmon season should stretch out for at least another couple weeks before the action slowly starts to fade out. Usually around this time of the year I would normally be targeting steelhead instead of salmon. Since it is a low water year and the water temperature has been very warm this fall I’ve been targeting salmon knowing the steelhead fishing hasn’t picked up just yet. Please remember that the rivers see the most amount of traffic this time of the year. Give anglers their space on the water and try to promote sportsmanlike behavior on the river if you see someone fishing in an unsportsmanlike way. If that kind approach does not work with those who show no etiquette and respect for the watershed carry on and go fish another spot. Be cautious when landing and grabbing salmon because there is a good chance that there can be a hook sticking out of it from being foul hooked before. My friends and I walk out with a bag of garbage whenever we can after spending a day on the water. Actions like these keep stretches of fishable water open, land owners happy, and it keeps us fishermen and outdoor enthusiasts happy in the end as well. Play it safe on the water and have a great fall season! Editor’s Note: For more info on Bojangles and his Ontario fishing adventures and seminars please visit https://www.facebook.com/anglewithbojangles. To learn how to cure eggs for Ontario salmon please see his recent blog: https://www.pautzke.com/learn-how-to-cure-skein-ontario-style.